Are you ready for the best trivia competition around? Think! provides eight rounds of challenging trivia covering various topics with a Junior Achievement - focused bonus question at the end of each round. 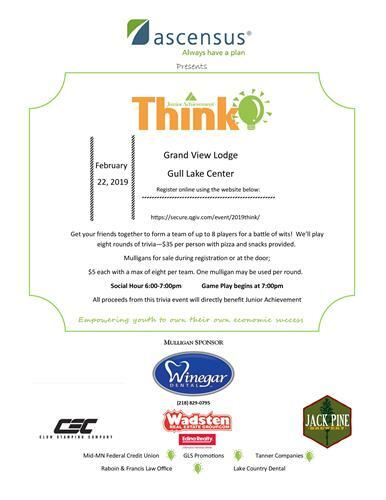 Hosted by and at the amazing Grand View Lodge, Junior Achievement provides food and entertainment with a cash bar also available. Now in our 8th year, this ridiculously fun event helps raise money for Junior Achievement's school-based financial literacy, entrepreneurship, and workforce readiness programs. So get your team of up to 8 players registered, have fun, and know you're helping support the 7,000 area kids we serve each year!